The Parlay System is a simple and effective positive progression betting system that compensates the flaws of Martingale betting system. This strategy is one of the oldest forms of betting and originally it derived from the same concepts that banks used to compound interest. In fact this system is based on pyramiding your profit. Using positive betting system, the player should increase his bet in case he wins and reduce his bet after a loss. 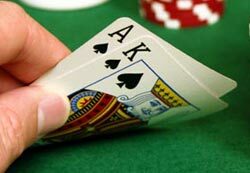 When a player wins he bets his winnings and his original bet and does so after each successive winning hand. With a loss, he would simply revert to his initial wager. In laymen's term (and as Webster’s dictionary explains it), “to parlay” means to use our money, gifts or talents or any other possession for what we want. Parlay seems a very ambitious and risky way to win, but when your luck is in, the winning tide is in it sure is quite efficient. In contrast to other betting systems, you shouldn’t have a large bankroll to use the Parlay betting strategy successfully. It involves less risk than similar betting strategies. It is one of the best systems for the game of blackjack. Parlay system is very effective since it goes well with other bet management systems and game strategies, is less risky than the Martingale system and other strategies and doesn't require a large bankroll to be efficient. In order to understand how the Parlay betting system works, we will draw an example. Let’s imagine that you play at a table with a minimum bet of $20 and let’s assume that you are a conservative player so your initial blackjack bet is $20. You get a blackjack — it is paid 3:2, which means that you are paid $30 on your $20 bet plus you get your original bet returned to you. Since you are using the Parlay system which tells to use the profit ($30) plus your original bet ($20) as a bet on the next hand, you place the $50 bet on the next hand. When you use Parlay betting strategy in blackjack, you need to bet your winnings and your initial bankroll as long as you win. If you continue to win, there is a big chance for you to earning huge money. However, experiencing a streak of losses is not bad either because you are betting the same amount. But when your winning streak abruptly comes to an end, you can lose the money that you have accumulated. As a remedy, you should fix the sum you are willing to gamble before playing. By setting limits, you can consistently win and not end up losing much. 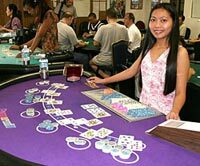 If you will use an effective system of money management and apply the Parlay betting method, then playing blackjack can be really rewarding. If you do the opposite, you will probably be disappointed and probably lose interest in gambling. Consistent with all progressive betting systems, Parlay should be applied together with the blackjack basic strategy to improve your gaming achievements.